The introduction of yet another 3G budget mobile phone by Nokia into the Kenyan retail market has excited most consumers eager to experience fast internet browsing and download speed. Nokia C2-01 3G features a high speed internet connection supporting live video streaming such as accessing Dstv mobile via internet on Safaricom network and fast download of compatible applications from ovi store. Nokia C2-01 3G handset supports easy access to emails and instant messaging; free ovi mail enables users to connect with family members and friends as well as chatting in real time with their loved ones through instant messaging. Demand for 3G enabled handsets has drastically increased in Kenya after key players in mobile telephony service provision; Safaricom, Airtel and Orange expressed interest to embraced 3G network. Cheaper 3G enabled handsets such as Kabambe 3G have ever since been introduced in Kenya to combat increasing demand for 3G enabled budget phones; Nokia C2-01 gives consumers in Kenya an opportunity to experience best internet access speed at an affordable price. 2 inch Display Screen. Nokia C2-01 features a 2 inch display screen offering a resolution of up to 320x240 pixels. 3.2 Mega pixel camera. Nokia C2-01 comes in handy with a 3.2 extended depth focus digital mega pixel camera with a view finder. Take photos, rotate, edit and upload photos using Bluetooth or flickr using Nokia C2-01. Video Camera. The integrated 3.2 mega pixel digital camera can capture video in QCIF up to 15fps that can play up to VGA video clip length depending on available memory. Video codecs and formats supported include; 3GPP, MPEG4, H.263, H.264 and QVGA. Live streaming supported includes 3GPP. 46MB internal memory expandable up to 16GB with an external MicroSD card. Bluetooth enabled. Share files from Nokia C2-01 with other Bluetooth enabled devices wirelessly using Bluetooth technology. Nokia C2-01 integrated application include; Opera mini, Ovi store, Flickr, Facebook and Chinese dictionary among others. 3G enabled. 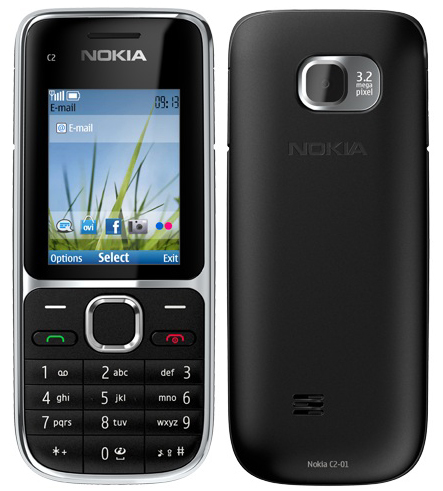 Enjoy faster internet access on Nokia C2-01 subject to availability of 3G network. Nokia C2-01 Price in Kenya: Kshs.7,199. Which are the stores stocking Nokia-c2 phones in Nairobi - Kenya? Kshs. 7,199 is cheap?...ok,thats where China phones BEAT YOU.